Spring is early this year. After a warm winter we’re having a warm spring as well, resulting in nature being a lot quicker as normal… Last weekend I tried to find some sunbathing Vipers, but I guess they didn’t need to get warm in the sun, as it was already warm enough. 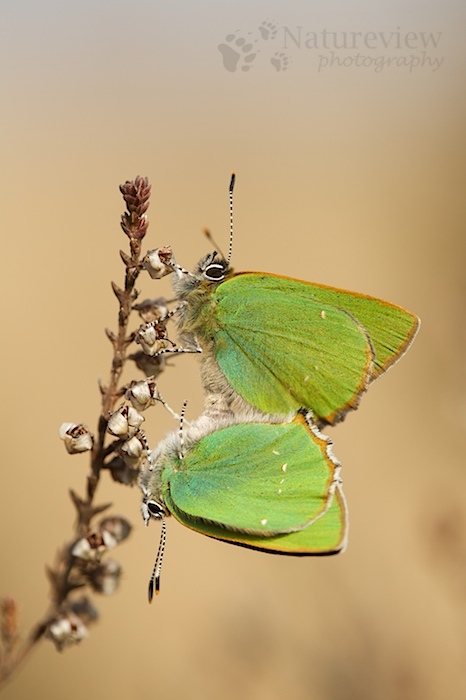 To my surprise I found a tiny green butterfly hanging in a heath bush. It turned out to be a very early Green Hairstreak. While I was trying to get some nice pictures of this gorgeous butterfly, I started to feel sorry for her. As she was so early, she probably had to wait a long time to find a mate… While thinking about that, a second individual arrived at the scene and it turned out to be love at first sight. After a very short courtship, they started mating, giving me a good opportunity to take some nice pictures. Previous Post Previous post: Hurray for the whales! Beautiful photograph. And where do you live. We had a horrible winter and are just now having a few nice days. The snow just melted…still a patch here and there. Sigh. How nice to be warm. Again, the picture is wonderful. I live in the Netherlands. Thanks for the compliment. Mooie kleurtjes en je wordpress thema er goed op aangepast. Dank je Peter. De achtergrondkleurtjes heb ik zelf geen controle over, die worden er automatisch bij gezocht (wel op basis van de foto).